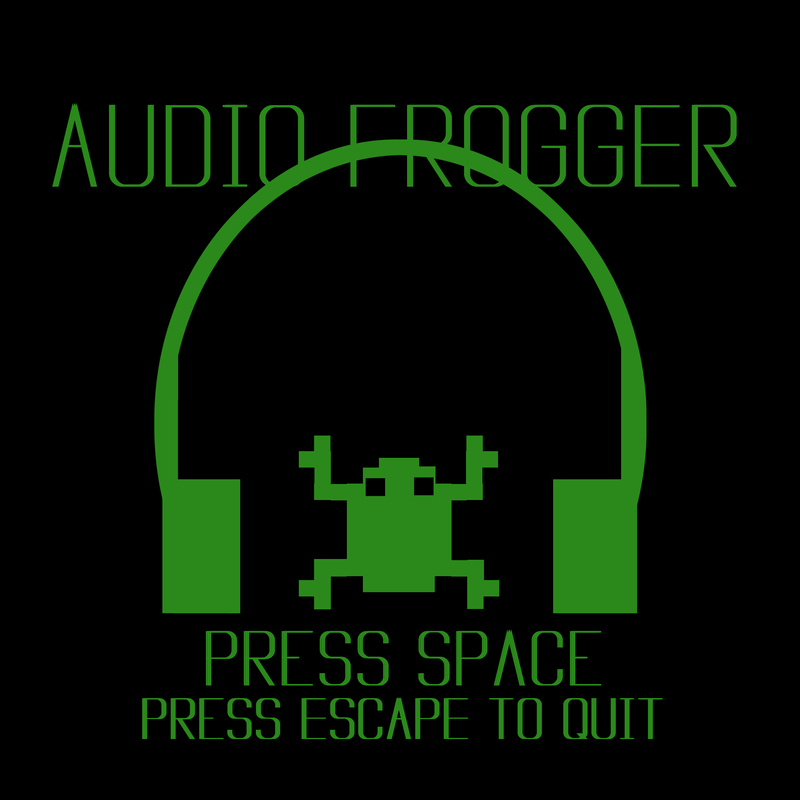 Audio Frogger is an audio only take on the original Frogger game. Using 3D sound, panning, and volume control, the game attempts to generate a cohesive scene. As in the original Frogger, the player must cross a busy highway to reach home, a pond. As the pond is the goal, the play field spans an eight lane roadway, and does not extend into the pond. The lanes of traffic have varying numbers of cars traveling at varying speeds. The player must utilize the soundscape’s context to place themselves within the road and judge when to proceed by strategically waiting for cars to pass their location. A successful cross will push the player through space to the next lane of cars, avoiding the cars currently ahead of them. As the player progresses, more and more cars begin to pass, increasing the difficulty of each cross by increasing the surrounding noise chaos. The game is meant to be played over headphones and while wearing a 3D blindfold. The blindfold allows a player to open their eyes while still being left in darkness and thus intensifies and focuses the aural experience that constitutes the game. In it’s current form, Audio Frogger loses people. The soundscape was never quite cohesive. Players were not able to place themselves in the environment, as they couldn’t tell whether they were in front of or behind the passing cars. In reality, players start in a safe zone from where they can listen to passing cars. Whenever they feel it’s safe, they can cross this lane of traffic. If they were hit by a car, a death sound plays. Otherwise they’ve successfully completed the hop and are left in a new safe zone from where they can hear only the lane of cars ahead of them. It was suggested that I give players a visual diagram of this process on the menu screen, something I think I will definitely integrate. Using the extra 3D sound library in Unity would also greatly help, though I wasn’t aware of it until critique. A menu screen, which waits for a player to to press space to enter the game->a tutorial->the highway. If the player dies, a death sound plays. If a player wins, a win sound plays->regardless of whatever outcome, the player is then brought back to the menu screen-> upon pressing space again, the highway. The movement of the frog was also not picked up on. People were frustrated when the frog didn’t “respond” to their key presses. I implemented the jumps to take about a half second to complete, and gave the jumps a half second sound clip to indicate the beginning and ending of each pass. If space was pressed during this jump period, nothing extra would happen. To fix this, I could add a short, small, negative sound when the player presses space within a jump period, so they at least know they can’t jump while executing another jump. My original iteration just had the frog teleport to the next lane of cars, which broke the sound flow and wasn’t realistic. I did smooth over the rough volume transition of cars as they cycle over the lane. My first iteration destroyed the cars once they reached the end and then reinstantiated them at the beginning of lane. I tried teleporting the car back to start, increasing the physical distance of the “ends” of the lanes, and eventually settled on a system that teleports the cars and fades their volume in or out relative to their distance to or from the player. This taught me about coroutines, though the final version did not use them, something I’d never tackled before. Overall, I learned more through this project than how successful it was. Sound and 3D work were completely new to me, and loosing visual input was both a challenge for me as a visual artist and a game designer. The work will be salvaged and improved through the feedback given in critique, but I don’t plan on making any more aural-only absurdities.